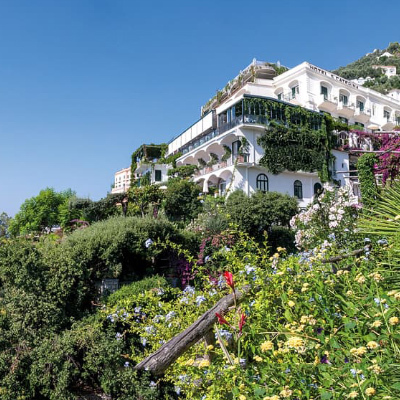 On a recent trip to the Amalfi Coast, we were delighted to visit Hotel Santa Caterina, which boasts an enviable location overlooking the coastline. 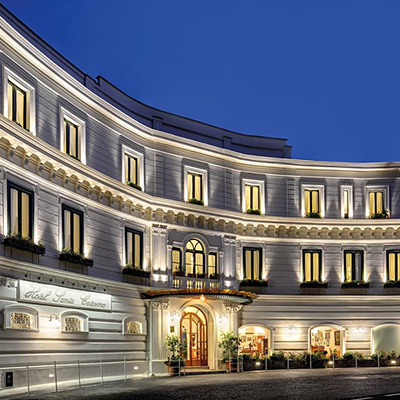 This is a simply stunning hotel, and we were delighted to be staying at this wonderful property. When we arrived, we took a moment to take in the scenery, which was really quite breath taking. As we entered the hotel itself, we were no less in awe of the wonderful, typical Italian décor that was really quite beautiful. 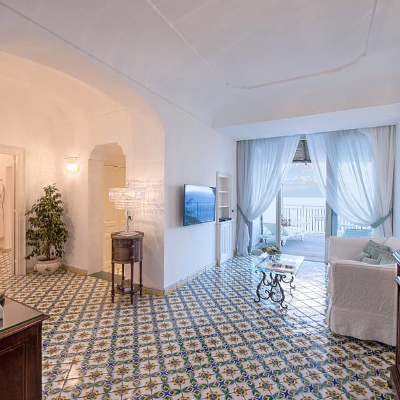 With whitewashed walls, beautiful tiled flooring, and statement antiques, this hotel is both authentic and exquisite in its design. We were greeted warmly at reception and shown to our suite, which was similarly stunning. Mimicking the décor throughout the hotel itself, our suite was fresh, clean and immaculately presented. It truly did encompass the beauty of Italian charm. The patterned tiled flooring was a real style highlight for us. The real highlight of our suite however was the two balconies that offered unrestricted views of the Amalfi Coast. One of the balconies was located off the bedroom, which offered a small table and chairs and was the perfect location for a morning coffee. The second balcony was located off the living room and was much larger in size, boasting two sun loungers along with a dining table and chairs – perfect for our morning breakfast. The views from these balconies were exceptional, and they really allowed for us to make the most of this wonderful location. As well as a living area and bedroom, the suite also boasted a beautifully appointed bathroom complete with his and hers wash basins, a separate walk-in shower and a large bath. There was also a further toilet off the bedroom area. In terms of facilities, the suite offered a flat-screen television in the bedroom and a second in the living area, as well as an espresso coffee machine and a fully stocked mini-bar. In terms of facilities in the hotel itself, Hotel Santa Caterina offers a wonderful wellness spa, delivering a fantastic range of treatments along with a small yet well-equipped fitness room. For foodies, there are a few different options of restaurants and bars, including Restaurant Santa Caterina, which has been awarded several awards. 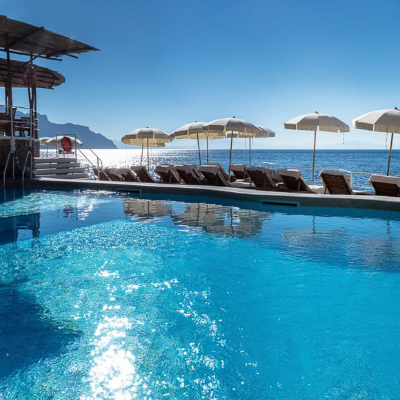 Restaurant Al Mare is also open from May to October, serving delicious lunches, and bar options includes their Il Grottino bar and their La Terrezza bar, as well as the hotel’s well-stocked Wine Cellar. 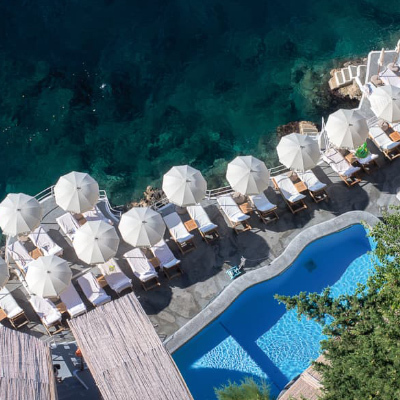 Another real highlight of Hotel Santa Caterina is their Beach Club. The Beach Club can be found nestled right on the seafront, and as well as having access to the water, there is also a beautiful pool and plenty of sun loungers for those looking to sun themselves in between cooling dips in the water. The Beach Club was without a doubt one of our most favourite parts of this hotel, and we found ourselves relaxing there most days, taking in the stunning views. We even managed to enjoy swimming in the sea in October, and we weren’t alone. We were thrilled with our stay at Hotel Santa Caterina, and wouldn’t hesitate to return; in fact, we can’t wait to do so. The team were impeccable, the views were to die for, and the facilities were outstanding. 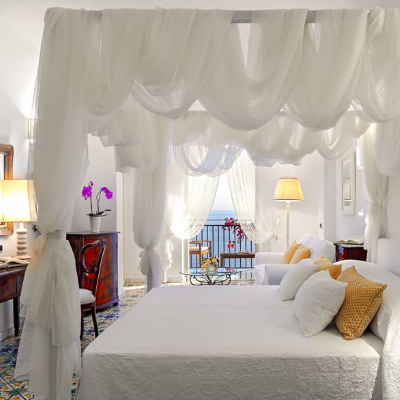 This hotel comes highly recommended by us as a fantastic option of accommodation on the Amalfi Coast.